Six Nations champions Wales were made to work for an unconvincing 25-15 win over the Brumbies at Canberra Stadium on Tuesday. In the only mid-week match of Wales' tour Down Under, the visitors held off a spirited Brumbies side that threatened a second-half comeback after trailing the Welsh 19-6 at half-time. 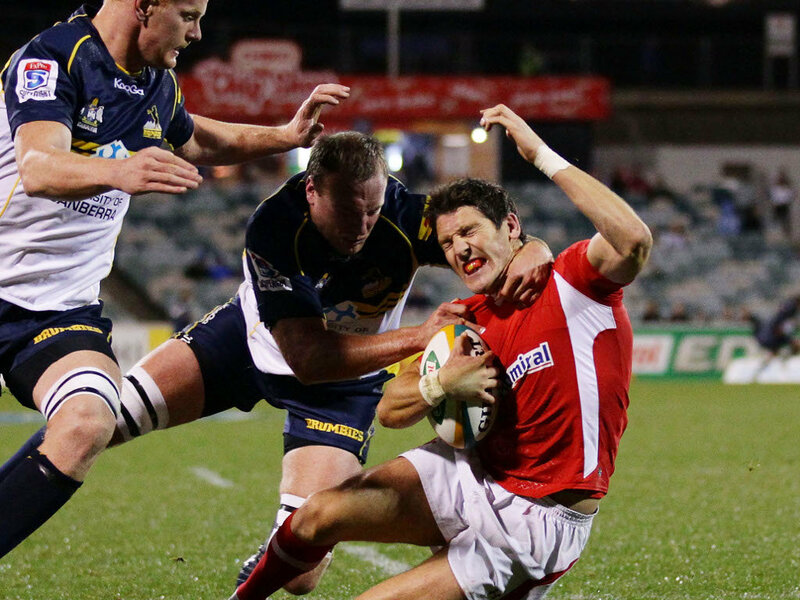 The Jake White-coached Brumbies managed to reduce the deficit to 19-15, but James Hook – who contributed 15 points for his team – struck two late penalties to give Wales their first victory of the tour. The tourists made 14 changes from the side that lost to the Wallabies 27-19 in Saturday's first Test, and Hook was quickly to work in his favoured position as he crossed for an early try. The Perpignan star then combined with Ashley Beck to send Justin Tipuric for another, and Wales looked comfortable in a 19-6 half-time lead once Alun Wyn Jones had barged over for a third. The second half belonged to the Brumbies, and skipper Zac Holmes booted a trio of penalties that hauled the hosts to within four points. But a pair of late Hook replies steadied the ship and ultimately secured Wales their second win over the Brumbies in four outings since 1978. Brumbies: 15 Robbie Coleman, 14 Cam Crawford, 13 Tevita Kuridrani, 12 Andrew Smith, 11 Kimami Sitauti, 10 Zack Holmes, 9 Ian Prior, 8 Ita Vaea, 7 Colby Faingaa, 6 Peter Kimlin, 5 Ben Hand (c), 4 Leon Power, 3 Scott Sio, 2 Anthony Hegarty, 1 Ruaidhri Murphy. Replacements: 16 Siliva Siliva, 17 JP Pradaud, 18 Dylan Sigg, 19 Fotu Auelua, 20 Beau Mokoputo, 21 Tom Cox, 22 Jesse Mogg. Wales: 15 Liam Williams, 14 Harry Robinson, 13 Andrew Bishop, 12 Ashley Beck, 11 Aled Brew, 10 James Hook, 9 Rhys Webb, 8 Aaron Shingler, 7 Justin Tipuric, 6 Josh Turnbull, 5 Luke Charteris, 4 Alun Wyn Jones (c), 3 Rhodri Jones, 2 Richard Hibbard, 1 Paul James. Replacements: 16 Ken Owens, 17 Rhys Gill, 18 Ian Evans, 19 Gareth Delve, 20 Lloyd Williams, 21 Rhys Priestland, 22 Alex Cuthbert.